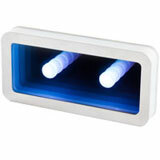 In this mode, there is active only the Zenlight technology with the algorithm 'White-colorful'. Using this algorithm, the device changes its color from white directly to one of the eight possible colors, depending on the behavior of the random events generator. 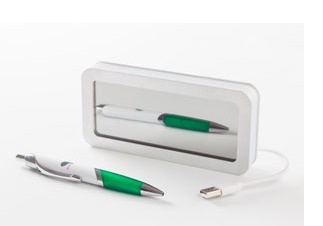 The color of the device's LEDs will remain white with a slight blinking of brightness, until the processor starts to detect statistically significant deviations in the flow of random data up to a certain threshold level. When this happens, the LEDs change color, randomly selecting one of the eight available colors (red, orange, yellow, green, light blue, blue, purple, or fuchsia) with minimum brightness. The longer the deviations are present in the stream of random events, the higher the brightness of the selected color will be. Such levels of brightness are 4. If the deviations come back to the before-threshold level, the color of the LEDs will turn white again. The next time when there appear the statistically significant deviations, the processor can choose another color. In a nutshell: 'anomaly' - color, longer 'anomaly' - the brighter the color. In this mode, there are simultaneously active two technologies - Zenlight with the algorithm 'White - colorful' and Bioland technology. In this mode, there is only active the Zenlight technology with the algorithm 'Rainbow.' 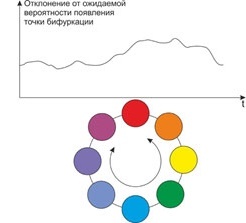 Using this algorithm, the device's LEDs smoothly transition between neighboring colors on the color circle, based on the behavior of the random events stream. The deviations in the random events steam from mathematical predictions are converted by the processor into the rate of color changing of the LEDs. For example, if the difference is small, then the color of the LEDs is almost unchanged over a long period of time or changed by a small amount, 'shivering' near some color. 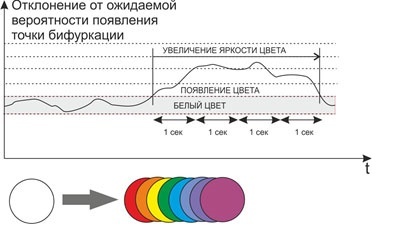 With the increase of deviations, there increases the rate of color changing of the LEDs on the color circle. In a nutshell: the more 'anomalies' - the sharper the color change. In this mode, there are simultaneously active two technologies - Zenlight with the algorithm 'Rainbow' and the Bioland technology. In this mode, there is only active the Bioland technology. Use the device in the modes with the Bioland technology (2nd, 4th, 5th modes) no more than 6 hours per day. Preferably used in the morning and afternoon. It is undesirable to use these modes just before bedtime (an hour before bedtime). You cannot use these modes during sleep.